Mozzarella cheese is surprisngly easy and delicious to make at home if you have the necessary ingredients and use un-homogenized milk. 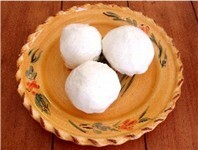 This recipe makes 4 good sized balls of fresh cheese. Put the milk in a heavy, stainless steel pot. Dissolve the citric acid in the water, and add this to the milk. Heat the milk to 88 degrees. At this temperature, you should see your milk begin to curdle. Add your rennet solution and stir slowly to mix. Continue to stir slowly every couple of minutes, and continue heating on medium low heat until the milk mixture reaches 105 degrees F. Turn off the heat, and let your mixture rest for 15 minutes. 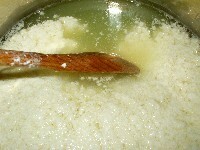 As the mixture sits, the curds will firm up and completely separate from the whey. Once you have reached this point, use a slotted spoon and scoop out all of the curds into a cheese cloth lined microwave safe bowl. Bring this bowl to the sink, and carefully bring the edges of the cheesecloth together, and squeeze to remove as much liquid as you can, discarding it. Microwave the curds on high for 1 minute. Drain off any additional whey that has separated. Push down on the curds with your hands or a spoon to develop the texture. 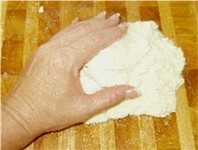 As soon as you can handle it, begin to knead it with your hands as you would bread. If using salt, add it to the cheese at this point. Continue to microwave the curds twice more for 30 seconds each time, kneading the cheese in between. If you find the cheese too hot to handle, you can use rubber gloves. Continue to work the cheese until it is smooth and shiny. When the cheese is ready, it will stretch like taffy when hot. 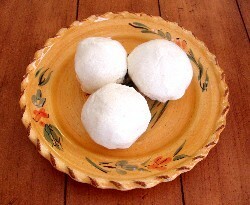 Shape your cheese into 4 equal sized balls, and drop these into a bowl of ice water to set. As soon as your cheese has cooled, it is ready to eat. This cheese freezes well and will keep in the refrigerator for 4 days in an airtight container. Note: If you prefer a firmer textured cheese, you can increase the amount of rennet used. 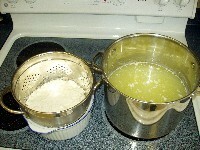 From left to right: The initial step; heating the milk. Checking the temperature of the milk. You can see the milk has already curdled. When you move the curds you can see the yellow colored whey underneath. 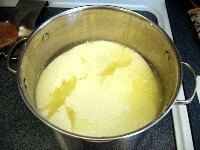 From left to right: The curds have completely separated from the whey. 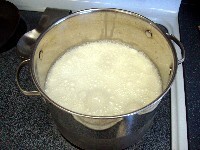 The curds are scooped from the pot. 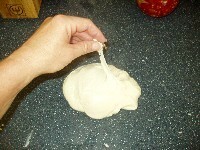 Kneading the mozzarella to make it smooth and shiny. From left to right: The cheese becomes stretchy. Place the balls of mozzarella in an ice bath. The finished product!